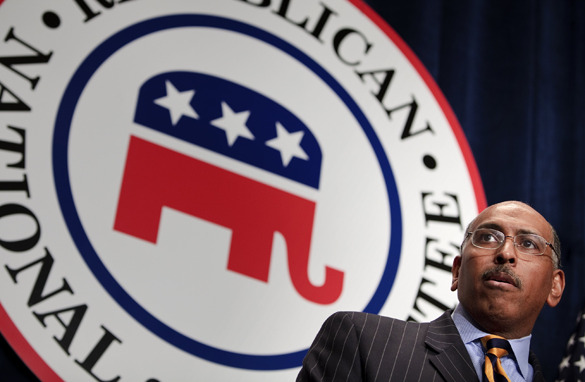 (CNN) - Republican National Committee Chairman Michael Steele - already under fire from some in the GOP over his turbulent first month at the helm of the party — looked to ease conservative concerns Thursday over his comments suggesting abortion is an "individual choice." "I am pro-life, always have been, always will be," Steele said in a statement. "I tried to present why I am pro life while recognizing that my mother had a 'choice' before deciding to put me up for adoption. I thank her every day for supporting life. The strength of the pro life movement lies in choosing life and sharing the wisdom of that choice with those who face difficult circumstances." On Wednesday, GQ magazine published a recent interview with Steele on its Web site, during which the RNC chairman called abortion a "choice" and said the matter should be left up to the states to decide. "I think that’s an individual choice," he said of abortion, adding that he thinks Roe v. Wade was a "wrongly decided matter." "The states should make that choice. That’s what the choice is. The individual choice rests in the states. Let them decide." The comments haven't sat well with some conservative activists, and Steele has reportedly reached out to several in order ease concerns on his abortion stance. "I expressed my concerns to the chairman earlier this week about previous statements that were very similar in nature. He assured me as chairman his views did not matter and that he would be upholding and promoting the Party platform, which is very clear on these issues," Perkins said. "It is very difficult to reconcile the GQ interview with the chairman's pledge." Perkins is expected to have more to say on the matter later Thursday after speaking with Steele directly, according to a spokesman for the Family Research Council. But in his statement, Steele said he is committed to the GOP's pro-life platform. "The Republican Party is and will continue to be the party of life," Steele also said in the statement. "I support our platform and its call for a Human Life Amendment. It is important that we stand up for the defenseless and that we continue to work to change the hearts and minds of our fellow countrymen so that we can welcome all children and protect them under the law." In the interview with GQ, Steele also suggested homosexuality is not a choice - another position that puts him at odds with some cultural conservatives. "I don’t think I’ve ever really subscribed to that view, that you can turn it on and off like a water tap. Um, you know, I think that there’s a whole lot that goes into the makeup of an individual that, uh, you just can’t simply say, oh, like, 'Tomorrow morning I’m gonna stop being gay.' It’s like saying, 'Tomorrow morning I’m gonna stop being black,'" he told the magazine. ...I'm done. I'm moving to France. So Repubs are for limited government, yet they want the government to tell a woman what she HAS to do in a decision that will impact the rest of her and her family's life? Do you Repubs ever stop to think that "liberals" (dare I say such a bad word) are pro-life too. None of us condone or encourage abortion. But we believe it is a choice that is up to the individual. Get it? "Lib" in liberal = the "lib" in liberty and "choice for the individual" = individual liberty. I thought you guys were all for that. When you make abortion illegal, you are imposing YOUR morality on everybody else (sanctioned by the goverment). When it's left up to the individual, the emphasis is on individual liberty, as heinous as having an abortion might be to you. They tried it Palin and it backfired, they tried it with Steele and it backfired. Not all female Politicians are Secretary Clinton and not all black Politicians are President Obama. It never works. You have to be orginal RNC. On average, human life is cheap, bordering on worthless. A million innocent people were murdered in Rwanda in the 1990s and the world barely noticed. Millions more are at risk in Darfur right now, and nobody cares. Know why? Because they're just little brown people who don't have any oil or anything we need. We casually accept our governments telling us, "it's okay... it was just collateral damage." We claim to respect and honour human rights, and our governments sidestep them when they're inconvenient. "Right to life", my eye. Anybody who can look around this demented slaughterhouse of a world and believe that a microscopic collection of cells that doesn't even have a central nervous system must be saved at all costs, is six bricks shy of a full load. Kathy – funny – for 8 years we had an idiot that couldn't speak WITH a teleprompter at the helm. Ultimately if we do ban abortions it won't solve the problem. Drugs, robbery, murder, ponzi schemes, etc... are all illegal but people still do them. The way to combat murder, drugs, robbery, is to address the conditions that cause these crimes. Abortion is the same way. If we want to stop abortions (which I think would be fantastic by the way) the way to do it is to address it's causes. Better access to healthcare, birth control (no not every community has a health center where they give the stuff away), education – better access to adoptions for people – which is incredibly expensive and bureaucratic . The conservatives often say instead of an abortion put the kid up for adoption – which would be great – except very few people can actually adopt kids because of costs and red tape involved. So the state ends up raising kids, which of course costs LOTS of money that about 45% of the country thinks is bad spending and not the government's job. Certainly abortion is morally detestable but criminalizing it will do nothing to slow it down. I'm sure my post won't be make the board because I'm not a right wing or left wing nut job criticizing everybody. But this was rather therapeutic. @ Dan Well, let us think that thorough. Those being killed in Iraq…don't know when we killed people in Gaza, but whatever… and so forth are trying to murder us in the name of fanaticism. have been killed. The republicans can continue with their inbreeding and there are going to be fewer of them too...you know, evolution? For all the religious fanatics: Do you realize the bible was written by those that thought the world was flat? And I find it hilarious that there are still people stupid enough to listen to Rush Limbaugh and, best of all, BELIEVE him! This guy better figure out what he believes and stand up for it. The GOP must be getting tired of looking like a bloody clown show. why don't woman just close their legs and stop sleeping around. I hope that clothes hanger fits well. Steele is right, the decision about abortion should be left to the States, get the feds out of it. They tried it Palin and it backfired, they tried it with Steele and it backfired. Not all female Politicians are Secretary Clinton and not all black Politicians are President Obama. It never works. You have to be orIginal RNC. KEEP RELIGION out of Government..its that simple.. That Mr Steele is just another PUPPET .. Steele, Rush Limberger, Palin, Bush, These people ARE FAILED HUMAN BEINGS looking to take the rest of us down..
Is Steele going to adopt all the kids that 'no one wants' from those forced to have kids? There are tens of thousands of kids older than a couple of years that no one is willing to adopt but no one cares what happens to them. Politicians only think of the little babies just born because they are 'cute'. Once all those kids are adopted by real families, then you can talk about taking away choices and not before. Deal with the full reality first. Let me guess, the real leader of the republican party "Rush Limbaugh" took issue with one of his followers said. There is double standard here.Repubs are in theory pro-life but they are at the same time the highest blood-thirsty breed of warmongers. The RNC probably made a mistake by electing this guy its leader. The color of his skin is the only reason he was given the post....and of course this was only because the Democrats have Obama. This is just another example of the Republicans choosing to IMITATE the Democrats rather than offering the American voter a clear alternative. I'm all for minorities in leadership positions, but it has to be for the right reasons. The Republicans need to get back to the principles that made it the majority party. If it does this, the votes will follow. They don't need a BIGGER tent. They need a BETTER, more defined tent. Carl W Smelcer- you're right. and Steele is a joke. However, I'm not laughing. @ Fair is Fair, who said :"A healthy human baby cannot survive independently. Where do you draw the line?" A healthy human baby can be raised by someone else. A human zygote (and the fetus until a certain point) cannot, under any circumstances whatsoever, survive independently of the mother's womb. Hey, look at it this way...maybe with all this evil stem cell research, they'll figure out how to grow babies in vats filled with magic scientific fluids and solve the whole problem for us haha.